That’s right. The one feature semi-announced at Blizzcon for the future of pet battles is no more. I find the wording here interesting for a few reasons. One, Mr. Stockton specifies Draenor’s release, leaving things wide open for 6.1 and beyond. The other is the citation of balance concerns as the reasoning. I’m torn here, because for me, one of the main benefits of seeing battle pet breeding enter the game would have been to level the playing field. 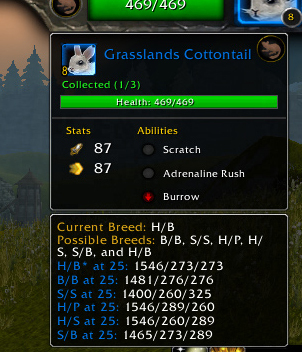 My crappy H/B Grasslands Cottontail could’ve been bred with one of my legion of S/S Spring Rabbits and been far more useful. With just one swap with a more common pet with a better breed, anyone else could’ve stacked the deck in the same way. But, rabbits are a dime a dozen, so that’s not a huge consideration. 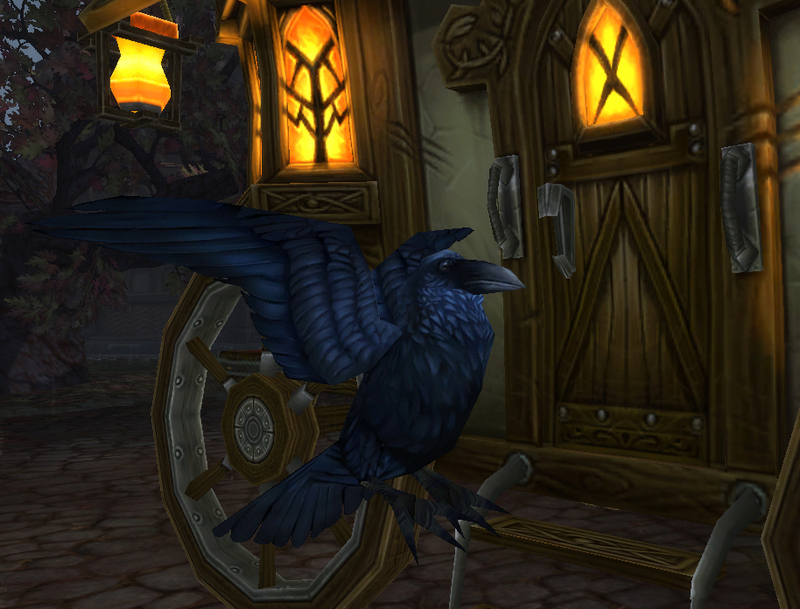 As another example, I was one of the lucky ducks who managed to snag a Power breed Gilnean Raven, widely considered to be relatively overpowered, as opposed to the later default, B/B breed only. Breeding would have allowed people to swap another, less strong battle pet’s Power with their Raven. As of now, the only way to get one is to pay roughly as much gold in most markets as a Crawling Claw commands. There are a lot of other examples: a Speed breed Death Adder Hatchling is in that same general price bracket as well. It makes for a much higher barrier to entry for people just starting to catch up now. However, in the hands of somebody like yours truly, I can definitely see where I would make a swap here or there for an extremely strong pet. So I guess it’s a little bit my fault, maybe. I’m also far less worried about breeding as a feature of pet battling per se. Immediately following Blizzcon, the overarching feeling surrounding battling was less than stellar, and many people latched on to breeding as a talisman, myself included. Frankly, it was pretty much the only thing we’d heard besides a maybe-perhaps mobile version. Even the mentions of breeding were secondhand. But in the time that has elapsed since, we’ve begun to see a far more broad view of battling as far as Draenor goes. I’m quite intrigued by the Eggs mentioned in passing, for one. There seems to be a wide array of new pets coming out, including my much-anticipated peacock. 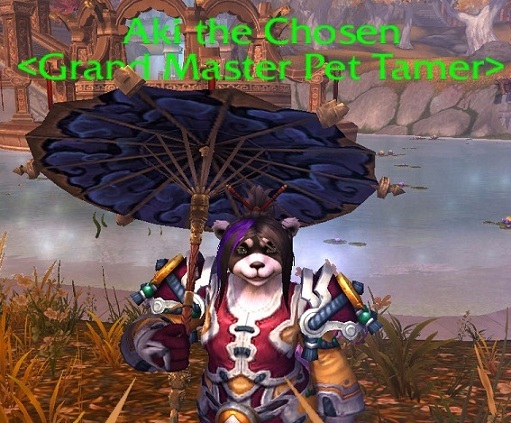 There are places in our Garrisons to display our pets, and new traveling tamers to visit us there. The loss of breeding now is far less keen, because we know there’s going to be plenty for us tamers to do once we hit Draenor. Also, many of the more fun, dynamic aspects of pet battling were added in subsequent patches, even though it was a central selling feature of the previous expansion. The Celestial Tournament, Beasts of Fable and Spirit Tamers were all later additions. The minigame used to just end with Aki as the last challenge, and I think it’s a good thing that we get to add on as the next expansion goes, again. Though, the Aki of Draenor may not be too happy about it. This entry was posted in Uncategorized on April 28, 2014 by Liopleurodon. Content concerns. I think we’ll be collecting new pets in the world for 6.0. They want us to waste time farming for the best breed instead of just grabbing the first rare we see and breeding it to the breed we want. It’s hard to say, I think, just because we had no idea as to the mechanics involved. The rumor was that every attempt at breeding would destroy the pet contributing the offspring’s breed, meaning that in the end, breeding might be even more time-consuming than normal farming. You couldn’t just use the same S/S pet to repeatedly contribute breed. The biggest difference would be seen mostly in pets with very few breeds (eg, the Scourged Whelpling) and vendor pets, most of which have fixed breeds. I was excited to try out my Clockwork Gnome in both S/S and P/P varieties, for instance. But, I think those instances are likely why they’re putting it off until later in the expansion. Time will tell though. Mumper said they didn’t want us to feel obligated to keep breeding until we had all epics in our collections. I can see their point even though it would have been fun to try. You’re right though, they only stated ‘release’ so there is hope.